Born at Pittsburgh, Pennsylvania, November 19, 1868, he earned the Medal of Honor while serving aboard the USS Nashville near Cienfuegos, Cuba, during the Spanish-American War, on May 11, 1898. He died on September 16, 1937 and was buried in Section 6 of Arlington National Cemetery. Pittsburgh-born Robert Blume enlisted in the U.S. Navy in July 1897 and 10 months later found himself aboard the USS Nashville at the outbreak of the Spanish-American War. According to the "Allegheny County Medal of Honor Recipients'' by Wes Slusher and Joe Pulgini, the Nashville and the USS Marblehead were dispatched May 11, 1898, to cut underwater cables at Cienfuegos, Cuba. At 6:45 a.m., both ships opened fire on the Spanish army barracks and cable house at Cienfuegos. At the same time, four small boats, two steam launches and two sailing launches, set out to locate and cut the telegraph cables. The steam launches, armed with a one-pounder Hotchkiss gun and Marine sharpshooter, provided cover. The sailing launches dragged the ocean bottom with grappling hooks. One 6-inch armored cable was hoisted, and while under enemy fire, cut with axes and saws, Likewise the second cable fell under the ax. Spanish reinforcements arrived increasing the firepower aimed at the launches. The small boats hit by Spanish fire started to spring major leaks as American sailors fell under the rain of fire. As the launches returned to the Nashville and Marblehead, a constant barrage followed. During the operation, three Americans were killed and six wounded. 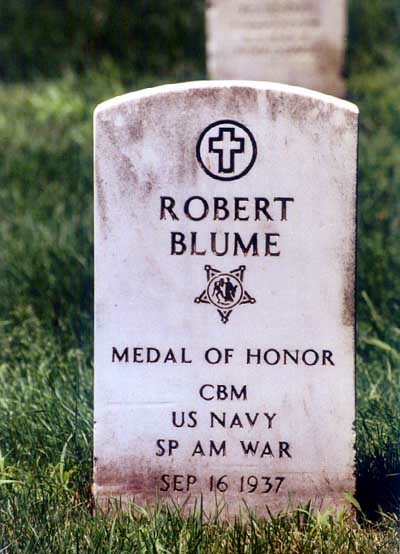 Seaman Blume earned the Medal of Honor for extraordinary bravery and coolness during the operation, which saved many American lives. 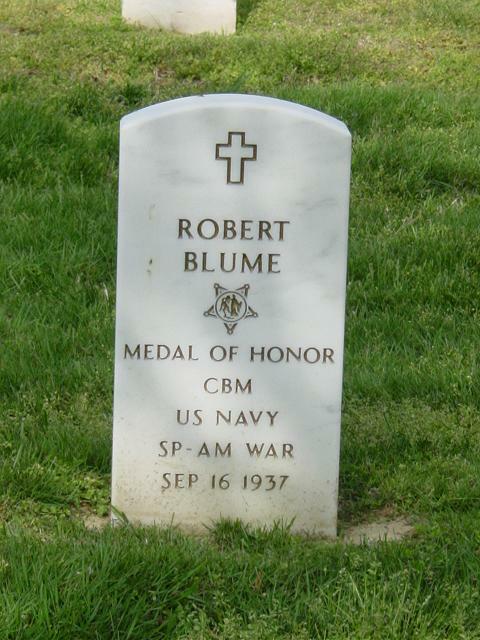 Blume received the medal July 7, 1899 (General Order 521), and remained in the Navy, reaching the rank of chief master of arms. He married and had a son, George Robert Blume. 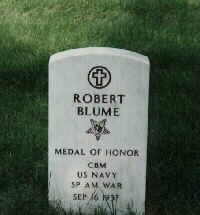 Robert Blume died Sept. 16, 1937, and is buried in Arlington National Cemetery, Section 6, Grave 9752. Rank and organization: Seaman, U.S. Navy. Born: 19 November 1868, Pittsburgh, Pennsylvania. Accredited to: New Jersey. G.O. No. :521, 7 July 1899.